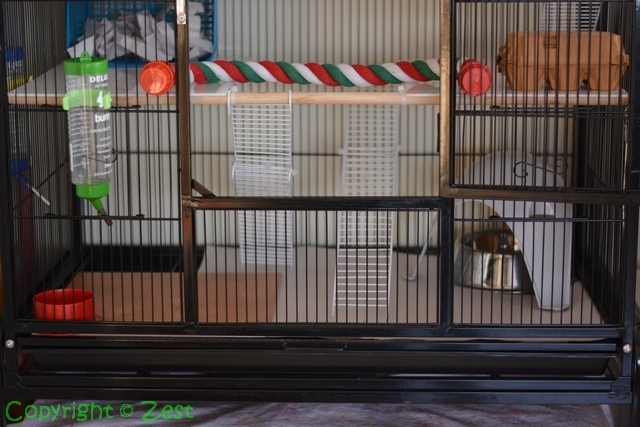 While we wait for the new rats to arrive (it seems to be taking forever… not that I’m all that patient 😉 ), let’s take a closer look at their new cage. 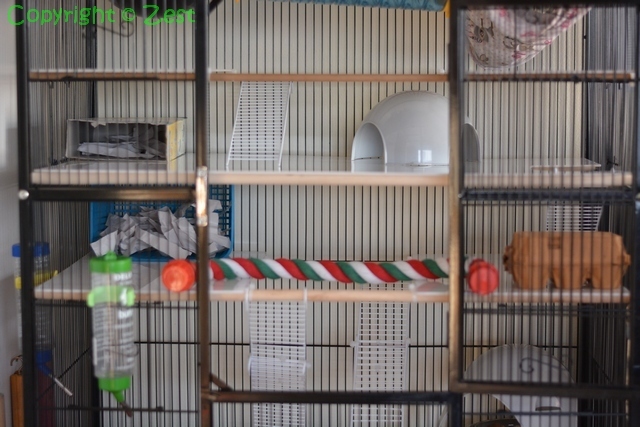 At the top of the cage we have a black plastic Sputnik, a plastic ferret tunnel and a makeshift hammock (an old PJ pants leg held up and open by two dowel rods). We’ve also found our best-yet solution to the question of cage levels. This time around we’ve laid thin sheets of white perspex across wooden dowel sticks. These are all removable and should be a cinch to clean each week – much better than either the metal trays or the cloth levels. 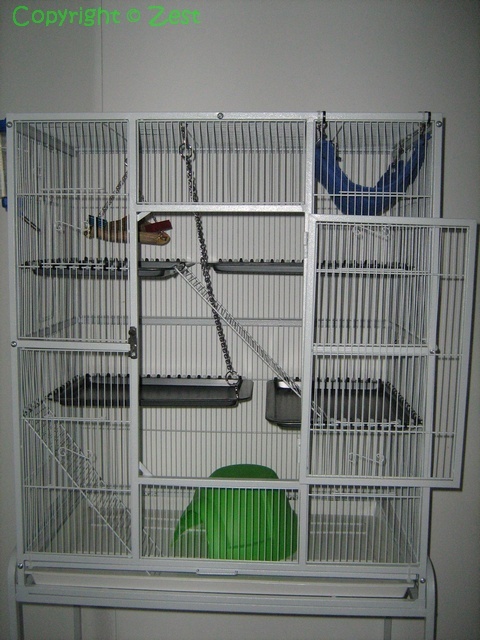 Most of the rat toys and accessories are on the two middle levels. 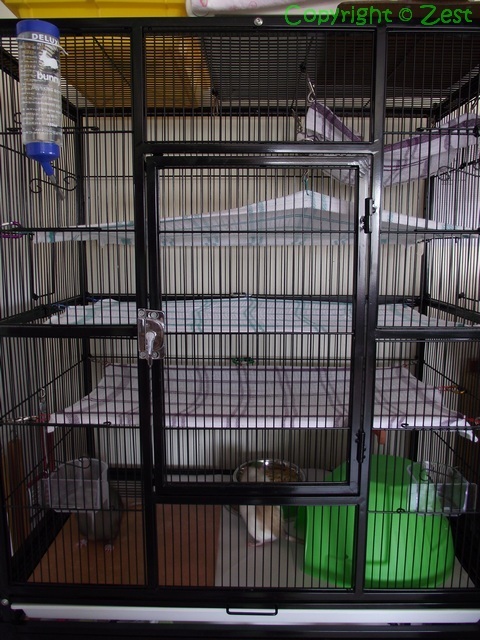 This cage setup is an improvement over our previous layouts because we’ve squeezed in an extra level. Here you can see cardboard and plastic boxes lined with shredded unprinted newspaper, a rope walkway, metal ladders, a mini dome (part of a Sputnik) and an egg carton. 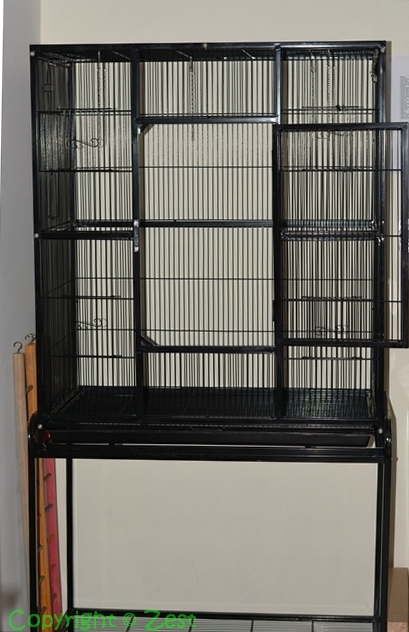 It’s so exciting to picture four little ‘scurries’ (as Ninja has dubbed them) exploring this cage! And what about Flea, I hear you ask? I’m sorry peeps. You know, I never intended for this blog to turn into a rat blog! Anyway, as we wait (two more sleeps!) for Saturday, here’s a post on the rat homes we’ve had in the past and the one we’ve prepared this time around. It’s a new black cage, but exactly the same kind and size. The major problem we found with the first cage was that wee, fur and and other interesting deposits got trapped too easily between the pull-ties and metal trays. Also, the trays quickly rusted where the holes had been drilled. So the second cage had cloth levels, as an attempt to have levels that were easy to remove and clean. 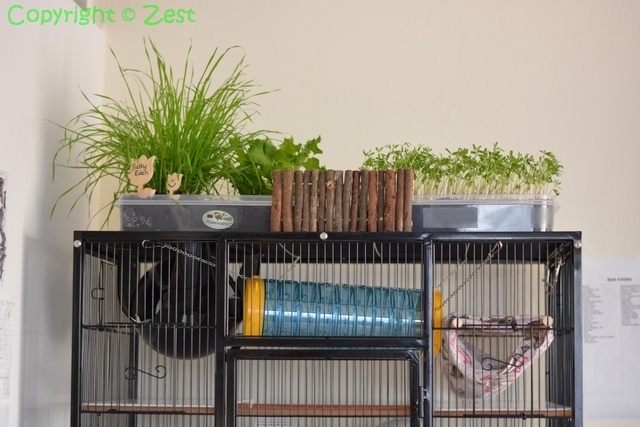 As for decor, the dome was still there and they had one main hammock, but we added a terracotta tile to help wear down their nails and often introduced temporary toys such as fruit on a stick or cardboard egg cartons filled with treats. In addition, the girls had more regular runs around our house, which also kept things interesting for them. 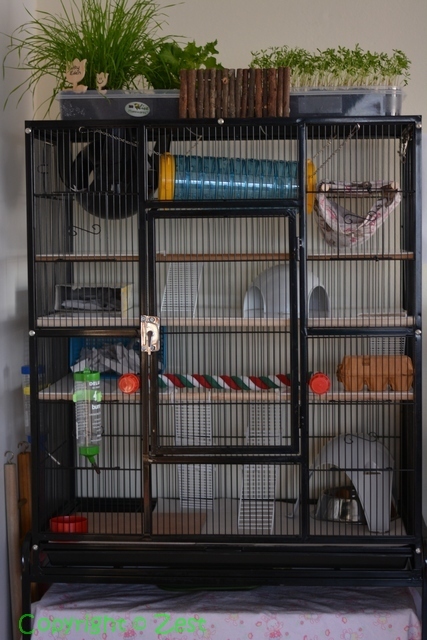 Despite that, when we began planning for more rats Ninja and I both wanted to do far more with the cage space and the toys and accessories. As our knowledge has improved, so have our ideas. For one thing, we’ve had a leap in pet hygiene since I recently purchased F10 SC solution, which is an animal-safe veterinary-quality disinfectant. 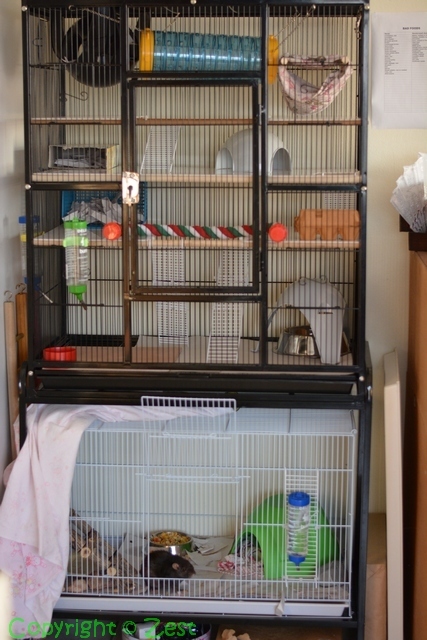 So the first step was to thoroughly clean the girls’ old cage with F10 and a toothbrush. Shew. Tedious and time consuming but necessary and satisfying.